Bacha Rehman, father of six, runs a small grocery shop in Karora town, near his home village of Serei Kana in Shangla, Khyber Pakhtunkhwa (KP) province of Pakistan. He has been running the shop for nineteen years now. With his parents living with him, Rehman has ten family members (including his own wife and children) to support and provide a livelihood for. To meet the dietary needs of his large family, Rehman grows maize, vegetables and animal fodder on a small piece of land he owns. His wife and him also own three goats, two cows and some poultry as a means to provide for their family. In late 2015, an earthquake struck parts of Serei Kana and other villages, destroying Rehman’s house among many others. He reconstructed his small house using cement blocks with RCC1 pillars for the main walls and wooden RCC beams for the roof. The roof was further secured with CGI2 sheets, rafters and then covered with mud and soil. This sort of construction came as a new trend in the area and soon became a common practice here especially after the area was hit with recurring natural calamities such as the earthquakes in 2005 and 2015 and the heavy rains leading to floods in 2010. Serei Kana, however, has only one water pipeline that provides water to twenty-three houses. The water supply through this line is quite limited and inconsistent, making it insufficient to meet the needs of these many households. To add on, this main supply line has been leaking since it has not been well maintained over the years, resulting in an unnecessary wastage of gallons of precious water. With Shangla receiving less rain and prolonged drought seasons (from September to end of February), the district experiences perpetual water scarcity. Rehman was very concerned about the dismal water conditions in their village. The other villagers and him were unable to devise a long-term solution for the water scarcity situation on their own. After much thought, Rehman thought of storing the rain water that stands still on his CGI roof and is ultimately wasted, to reuse for actual consumption. He quickly shared this idea with a local carpenter, who agreed to working on it and soon created and installed a “rain water harvesting” system on the CGI roof of Rehman’s self-built house. Collecting the water from the roof was thus initiated and was a sensible solution but storing the water still remained a major challenge. Purchasing large barrels for water storage was a large additional and unaffordable expense for Rehman. 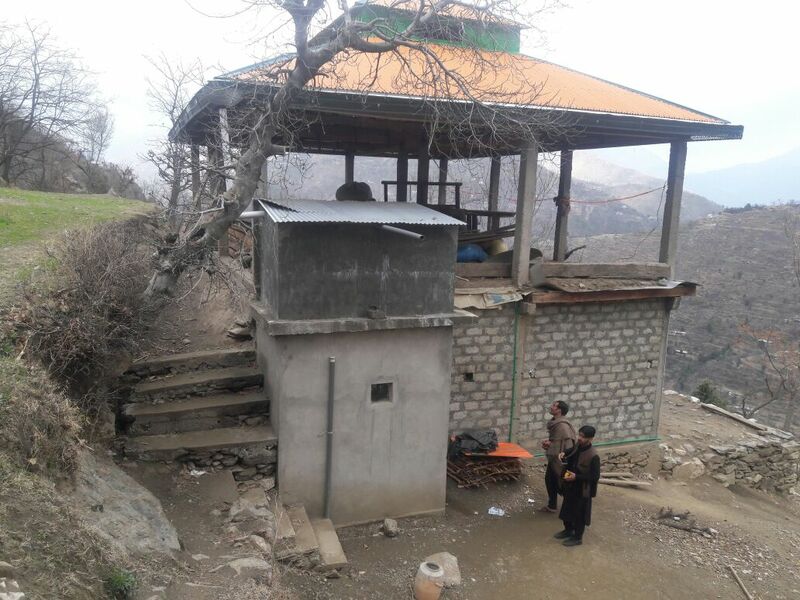 Community World Service Asia initiated an Integrated Emergency WASH and Shelter support project for the earthquake affected families in District Shangla in August 2016. Under its sanitation component, Rehman fulfilled the beneficiary selection criteria drafted for the project and was selected as a participant for construction of a new latrine. Under the project, material for complete construction of a new latrine along with cash for work labor was provided to him. Rehman constructed a latrine in his house. He managed the material in a way that he built a RCC roof along with a water storage tank to store rain water on top of the latrine. The water tank measured 6×6 square feet and five feet deep. The rain water collection system installed on the CGI roof was directed to the storage tank, with a valve being fixed with the tap and pipe line of the storage tank to control the water supply. The construction of a rain water collection system was Rehman’s own initiative. He used the material, which was left over after the construction of the latrine, provided by Community World Service Asia. Rehman and his family now have a constant supply of water in their house, fulfilling all of theirs and their livestock’s daily needs. His innovative storage system has inspired many fellow villagers who plan to replicate and install the water harvesting system on their CGI roofs to overcome water crisis. The water is used for all purposes including cooking, drinking, livestock, washing clothes and dishes. Once the tank is filled with water, it is enough to last a month for my family. The water is mainly stored to last us during the drought period. My family was provided with a hygiene kit as well, which included two plastic cans with a lid and one water pot (lota). The cans helped the family to carry and store drinking water in a safe way to avoid risks of water contamination. The frequency of having diarrhea and fever has been considerably reduced in our family. Soaps and sanitation cloths were also provided in the kit. Health and hygiene sessions were delivered to Rehman’s family as part of the project interventions as well. These sessions included awareness on maintenance of cleanliness in latrines and households and the importance and correct method of washing hands before and after meals and general guidelines on keeping their surrounding environment clean and safe.